Dozo is probably as far away as you can get from Nobu - it's certainly not trendy, there are no beautiful people here and it's located in that gastronomic junction of mediocrity, Camberwell. Don't let that put you off, you do get good food here. One of the things that does make me chuckle and cringe at the same are the words raw fish that appear in brackets after Sashimi on the menu. That certainly sums up the food IQ of its typical clientele. You certainly don't come here for fast food - this is a place for leisurely meals. 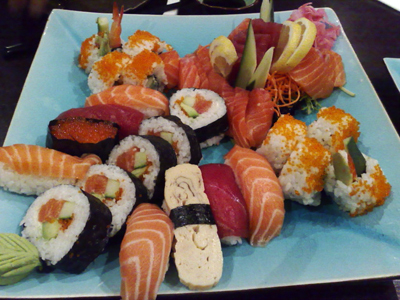 We order 4 starters to be followed by the Sushi and Sashimi Platter. The starters come out one at a time. 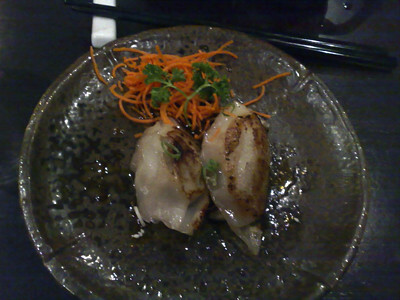 Gyoza ($6) come as a serving of 4 - these have a pork and vegetable filling. Gyu Tataki ($10) - this is one of Paalo's favourite dishes. 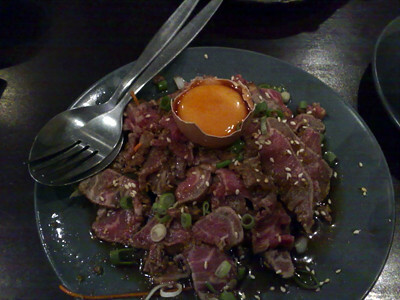 Barely seared beef sliced finely and served in a sauce of ginger, garlic and vinegar and topped with eggyolk. The beef is very tender and the sauce is nicely spiced. 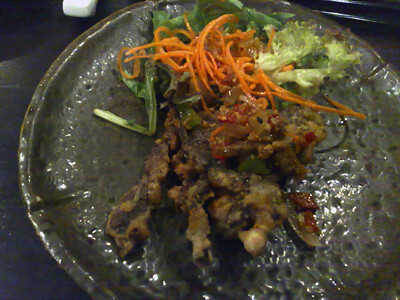 Sake Soft Shell Crab ($9.50) - marinated in sake it is then fried in an tempura batter. It comes whole and is then silver served at the table - lovely and crisp it is one of the nicest versions of soft shell crab we've had. 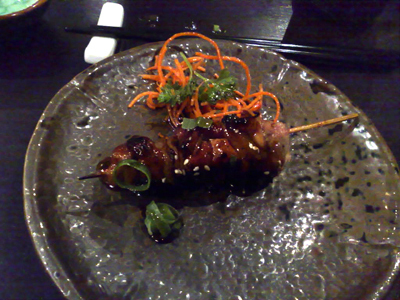 Chicken Yakitori ($7) - you do get two per serve. It's a good example of yakitori. Well worth the time it takes, it's fresh and delicious and certainly has us thinking about our time in Japan.